People visit Nevada for a wide range of reasons. Maybe you’re looking to explore the desert, or the more likely reason, to hit up Las Vegas. What most people don’t know, is that Nevada is home to some of the most unique road races you’ll find anywhere. From a race that only Las Vegas can host which includes a run through a wedding service to quirky theme-based runs, training for a road race in Nevada might just be the perfect combination of fitness and fun. This is a true rockstar race that shuts down the Las Vegas strip for a night. While people may worry about the heat and shy away from a desert race, the nighttime offers a manageable climate and of course ends in a party only Vegas can deliver. In true Vegas style, the racers have a chance to combine the love of running with making a commitment to true love as they run through a five-minute wedding service made for the runners on the go. The Red Rock Canyon event offers a wide range of races for all skill levels that promises to deliver an amazing view from the race route. The desert landscape and red rocks are worth the fast paced run. The race takes place during the mild winter months so the desert climate is also manageable for a wide range of skill levels. Starting under the Reno Arch this little run offers big fun for both seasoned runners and families walking one of the courses. Beyond the biggest little race you will find in the area, runners can follow the half marathon through Reno and the surrounding desert or take a shorter run at a 5K. This 5K and one mile fun run is part run and part fantasy as runners are transported into the world of Cirque Du Soleil. If you can imagine running off to join the circus with much more glamour and a hint of Las Vegas show, this is the run you need to take. This race is a fun way to give back to a military cause. The idea is very simple, runners strip off a piece of clothing to donate at each 1K marker to the Goodwill and the fun follows. 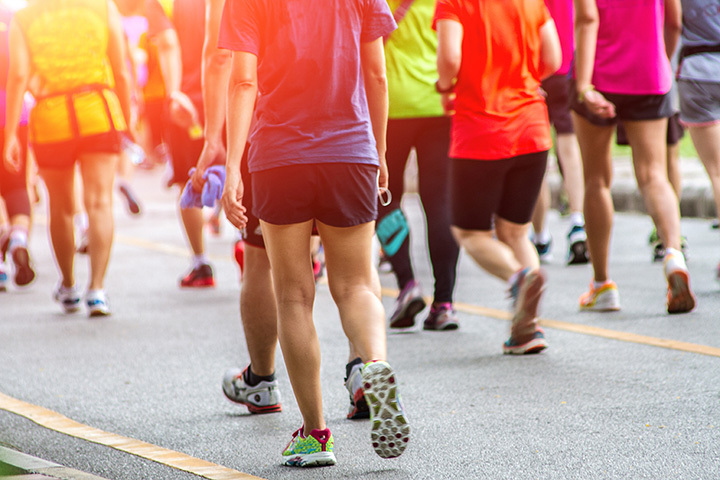 The local Goodwill uses donations for the Military Integration Program and the events welcomes dedicated runners, first timers and corporate teams out for a fun day of bonding. This unique race is not for the faint of heart with routes including the 100-mile trail run, 50 miles, “just” the average marathon and even a few more manageable 5K type races. This is one of the more challenging road races with trails being unforgiving at times but it is also a huge accomplishment to beat the Trail Trashed challenge. With a focus on raising money to help with the devastating after effects of fires in the local area, the University of Nevada extension sponsors this high endurance event. Their efforts push towards 100 percent net donations going to this worth cause and to educate on the danger of wildland fires. Taking a bit of the sting out of the winter in Las Vegas with some yummy hot chocolate is the perfect way to end this educational fun run. It's 15K or 5K for the full course and the reward is an event that surrounds runners with the best chocolates in the area and all sorts of educational activities about your favorite sweet treat. No reason to feel guilty about an evening sampling chocolate after this run! For novice runners or those with families they are hoping to get into running with them, this is the race to try. The route runs through a variety of bouncy house type obstacle courses without forging the distance so its a fun and healthy introduction to the love of running. This is a true all ages event and all abilities with a focus on a joy for fitness and running. The Super Hero Run has found a true fan base in Las Vegas as this dedicated group of average runners turn into caped crusaders for the day for great children charities. Who doesn't want to light up a child’s day by creating their own unique super hero? View more Nevada Road Races.